Five adorable short stories about Pokadot and Bleu's Autumn adventures around the knoll. You'll enjoy playing tickle football, finding the perfect pumpkin, roasting autumn vegetable stew, getting lost in the forest and jumping in piles of leaves. Take a hop through the forest with Pokadot and Bleu in their favorite season of the year! For children ages 2 - 6 and the young at heart. Not long ago, G. & G. Graham were anxiously anticipating the birth of their first grandchild. While on vacation, they awoke one morning to see a tale unfold of 2 sweet bunnies that they might tell to their grandchild. Wearing her favorite polka dot pajamas and GPa in his blue pjs, Mrs. Graham was inspired to name the bunnies Pokadot and Bleu and the first story of Sally Starfish in, © A Day at the Seaside was born. 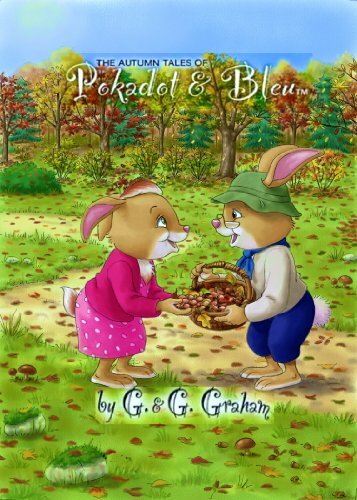 Pokadot and Bleu are two bunnies who live on Autumn Knoll at the edge of Beartown Forest. The stories are about daily adventures with their forest friends and grandbunnies. Pokadot and Bleu adore and support one another and love to have fun together. They encounter life s challenges, as we all do, and work through them to produce positive outcomes. Over the next four years, they continued to tell stories to their granddaughter about Pokadot and Bleu. Her enthusiasm and request for more and more stories spurred them on to continued writing. And as is the way with bunnies, their grandchildren also multiplied quickly, which they happily wove into some of the stories . . . along with their friends, Brownie and Betty Bear, Bernie and Beatrice Beaver, Donald and Darling Deer, Freddie and Fergie Fox, Oscar and Olga Otter, Ollie and Olivia Owl, Skylar and Sabrina Skunk, Sammy and Scarlett Squirrel, Gordon Gopher, the Right Reverend Rabbit, and of course, Sally Starfish.